Four top-10 teams lost on Saturday. Yeah, college football Week 7 was absolutely bonkers, as upsets and crazy situations unfolded around the nation. In addition to the huge upsets, we saw two teams brawl, two head coaches go at it from their sidelines and one of the best players in the nation exit his game with an injury. Those are just some of the things we’re looking at as we survey the biggest happenings in Week 7. Minnesota gave Ohio State a real run for its money on Saturday. The Golden Gophers were down by just three points at halftime and at one point led 14-10. Unfortunately, a rash of mistakes, coupled with a strong second half by the Buckeyes, kept them from pulling off a major upset. After Minnesota went up 14-10, Dwayne Haskins and Co. woke up in a big way to rattle off 20 unanswered points in the 30-14 victory. Haskins once again had a stellar day through the air, passing for 412 yards with three touchdowns and no interceptions. His final touchdown of the game was the victory-sealing score, and another was one of the weekend’s most electric highlights, as K.J. Hill wowed the nation with a one-handed nab. The Buckeyes are still perfect through seven games, and in all likelihood they will remain so when Michigan comes to town in late November. Florida might have gotten caught looking ahead to next weekend’s home game against Georgia. Vanderbilt came out firing on Saturday, going up by the score of 21-3 midway through the second quarter. During this portion of the game, it really looked like the Gators were going to fall, especially because head coach Dan Mullen nearly got himself ejected following a targeting call against James Houston. A 12-play drive that culminated with a Lamical Perine seven-yard touchdown run stemmed the tide, however, and sparked a huge comeback. The Gators went on to score 24 straight points before Vandy could counter, and the potential upset turned into a double-digit win for the road team. Vanderbilt deserves plenty of criticism for folding. At the same time, Florida’s response to the early hole was impressive. Gus Malzahn landed a monster contract extension from Auburn after the 2017 season. Since then, the Tigers have looked anything but fierce. Following up a pathetic performance last weekend against Mississippi State, they were upset at home Saturday by Tennessee, which hadn’t won at Jordan-Hare Stadium since 1998. Fans were absolutely furious with the way Auburn lost on Saturday, and one fan has started a GoFundMe account to try and raise the money needed to buy Malzahn out. Auburn’s offense is a wreck. Jarrett Stidham has been putrid. The defense just gave up nearly 400 yards and allowed 10-of-19 third downs to be converted…by Tennessee. Yeah, things are not looking great, and you have to wonder if there are people in Auburn wishing they had waited one more year to pay Malzahn. The Nebraska football program has been a fixture in the college football landscape since it was founded back in 1890. Now 128 years later, Scott Frost has managed to do something no other Cornhuskers coach has done in the program’s storied history. With Saturday’s gut-wrenching overtime loss to Northwestern, the Huskers have gone 0-6 to start a season for the first time ever. This was a game Nebraska had in the bag, too. Only, with just under five minutes left in the game, up by 10 points, the bag ripped open. With it, the team’s hope of winning its first game of the season spilled out. It’s been a long, long season for Frost and the Cornhuskers. It might get longer still, and nobody should discount a winless season as a viable possibility. Notre Dame played poorly enough to lose at home Saturday against Pitt. Fortunately for the Fighting Irish, their opponent one-upped them with an atrocious second half. The Panthers led 7-6 at halftime. When Maurice Ffrench took the kickoff 99 yards for a score to open the second half, it really felt like it might be Pitt’s turn to pull off a huge upset. When they picked off Ian Book for the second time in the game, that looked like an even likelier outcome. Pitt missed a field goal on its next two offensive possessions, turned the ball over on downs on another possession and fell apart defensively, allowing Notre Dame to score 13 unanswered points. This outcome was more about Pitt losing than Notre Dame winning. Once again, the luck of the Irish keeps them undefeated this season. The easy mark in Georgia’s blowout loss to LSU on Saturday is quarterback Jake Fromm. He really was awful in this game, going for just 209 yards on 16-of-34 passing with one touchdown and two interceptions. But to point the finger at the quarterback would be missing the point. Kirby Smart and his coaching staff were outmaneuvered and out-coached by Ed Orgeron and Co. from the start of the game until its conclusion. Smart’s decision to try a fake field goal early in the game was the first of many coaching errors by him and his staff. LSU offensive coordinator Steve Ensminger was merciless in his attack of Mel Tucker’s defense as the Tigers made the Bulldogs react throughout as they dictated the pace and tenor of the action. LSU’s defense obviously ate Fromm for breakfast as well. The Bulldogs have skated through the schedule until this weekend. Faced with a strong opponent for the first time all year, they fell apart completely. The Pac-12 rivalry game between Washington and Oregon at Autzen Stadium Saturday afternoon was a heck of a lot of fun to watch. Both teams put forth exemplary efforts, and it wasn’t surprising in the least that it took overtime to decide the thing. Justin Herbert wasn’t as razor sharp as we’ve seen in the past but he played mistake-free ball and threw two tremendous touchdowns (including one that had NFL scouts drooling). Travis Dye and CJ Verdell were both highly effective pounding the rock and combined for 178 yards and two scores, including Verdell’s game-winner in overtime. Oregon’s defense forced a key turnover on the game’s opening drive which proved to be the difference between losing and winning, as the Ducks scored three points off that interception of Jake Browning. Despite all that, Washington kicker Peyton Henry missed a gimme at the end of regulation that would have won the game. What it all means is that Washington — already on the outskirts of the playoff picture with one loss before this weekend — is absolutely out of it now. And, barring some crazy developments, so is every team in the Pac-12. Longhorn faithful must have been sweating it when starting quarterback Sam Ehlinger was forced from the game early with injuries to his throwing shoulder and hand. Thankfully, the experience of Shane Buechele paid off as he did enough to give Texas a serviceable passing game. But the real star of the game for Texas was freshman running back Keaontay Ingram. Coming into the game, he had a total of 293 rushing yards in five games and had never carried the ball for more than 13 times in a game. Tom Herman leaned heavily on this young man on Saturday. He touched the ball 20 times and gained 110 yards on the ground. This was a significant performance, as it not only helped contribute to the 23-17 win but also was the first 100-plus yard performance by a Longhorn running back since Chris Warren III did it in Week 2 last year. Much like Washington, Penn State could not afford to lose on Saturday and still maintain a viable spot as a playoff contender. Playing at home against Michigan State, however, it seemed like the Nittany Lions would have no trouble continuing to rack up wins. 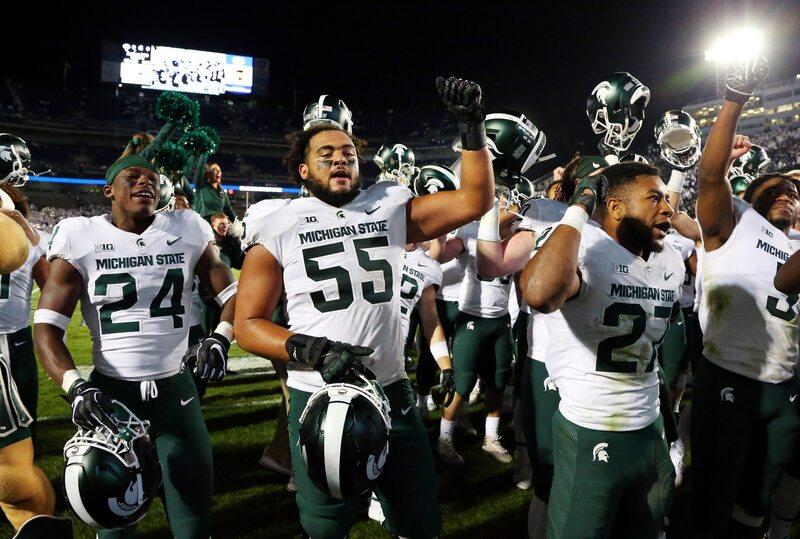 Brian Lewerke outplayed Trace McSorley as Michigan State was able to control the clock and grind out an improbable road win. The Spartans stepped up with their best defensive effort of the year. They had 11 more first downs and held Penn State to just 3-of-14 third down attempts. Between the second and third quarters, the Nittany Lions managed just three total first downs. At the end of the fourth quarter, down by three points,, Lewerke engineered an eight-play drive that spanned 76 yards in just one minute flat, culminating with his second touchdown of the game that proved to be the game winner. One week after handing Kentucky its first loss of the season, Texas A&M once again justified its spot among the nation’s elite teams with a gritty win over an underrated South Carolina squad. Kellen Mond had a tremendous game passing the ball, completing 67.6 percent of his passes for 353 yards. His lone touchdown went to tight end Jace Sternberger, who made national headlines for dragging a defender a quarter of the way across the field a few plays before that. Jake Bentley led a fierce comeback attempt in the third quarter and had a nice game in his return back from injury. But when it mattered the most, the Aggies responded with two 11-play scoring drives in the fourth quarter to put the game out of reach. Now at 5-2 on the season, its only losses coming against Alabama and Clemson, Texas A&M is in great shape to make a strong push for a New Year’s Six bowl game. For a while there it looked like the Knights were going to lose their first game since the 2016 season as they toiled on the road against Memphis. Thanks in large part to Darrell Henderson, who went over 200 yards from scrimmage, the Tigers opened up a 30-14 lead in the second quarter. McKenzie Milton rallied his offense, leading the Knights to a field goal right at the half to cut the deficit to two scores. In the pouring rain as his defense stepped up in a big way, Milton led two touchdown-scoring drives in the second half. Adding to his Heisman candidacy, Milton conjured John Elway on the final touchdown of the game as he helicoptered into the end zone, handing the Knights a one-point victory, 31-30. Still undefeated, the Knights are very much alive for a playoff berth, if the dominoes continue to fall their way. The UCLA Bruins entered Week 7 without a win on their record, but Chip Kelly’s team had shown improvement in recent weeks. On Saturday, it all came together for the Bruins on the road in Berkeley against the Cal Bears. Freshman quarterback Dorian Thompson-Robinson was nearly flawless, completing 13-of-15 passes for 141 yards. Running back Joshua Kelly was a juggernaut on the ground, chewing up 157 rushing yards and three touchdowns. UCLA’s defense, however, was the star. Forcing five turnovers, it held the potent Cal offense to just seven total points in the 37-7 blowout win. Talk about ending a streak emphatically. Kelly’s gang did just that and is showing some serious signs of life heading into the second half of the season. The Cyclones did it again, folks. Last year, they knocked off ranked opponents Oklahoma, TCU and Memphis. Before Saturday’s game against No. 6 West Virginia, they’d already taken out Oklahoma State, and gave both Oklahoma and TCU a scare once again. Hosting the Mountaineers, the Cyclones absolutely dominated this game, winning 30-14. Heisman candidate Will Grier had his worst game of the season, passing for just 100 yards with only one touchdown and an interception. His counterpart, freshman Brock Purdy, had his second outstanding game in a row, passing for 254 yards and three touchdowns in the blowout win. Matt Campbell really knows how to get his team up for these huge games. Once again, it delivered a loss to one of the nation’s best. Tua Tagovailoa was having another monster game for the Crimson Tide when he went down with an injury that had everyone in ‘Bama nation holding their breath. Tagovailoa picked up a nice gain on a scramble but stayed on the ground after sliding. After being examined on the field he went into the medical tent where he stayed for well over 10 minutes and was visited by both his parents. Everyone was freaking out. Then, thankfully, he emerged from the tent with good news, which is that he had just aggravated his knee sprain and could play if the score were different. At the time, Alabama led 30-10, so there certainly was no need for Tua to play. The Crimson Tide went on to win by the score of 39-10 and is still the undisputed top team in college football. In our weekly preview leading up to college football Week 7, we highlighted the fact that freshman quarterback N’Kosi Perry had never attempted a pass in a road game. We wondered how he’d do, and whether Mark Richt would have him on a short leash. Perry did not perform well, throwing interceptions on back-to-back drives in the first half. Then Richt responded by benching his promising freshman for Malik Rosier, who had a very rough outing himself — hardly a surprising development. Instead of letting his freshman work through his issues and potentially come out on top (you know, like he did last weekend? ), Richt has compounded his problem by creating an unnecessary controversy everyone will be talking about this coming week. Oh, and of course Miami lost, even though the defense did a fantastic job forcing three turnovers and holding the Cavaliers to 16 points. We can expect to see Michigan rocket up the rankings after Saturday’s blowout win over Wisconsin. The Wolverines have looked somewhat iffy at times this year but entered Week 7 with some momentum after destroying Maryland in Week 6. That momentum clearly carried over as they romped over their B1G rival, 38-13. As we’ve seen all year long, Michigan’s defense led the way. Wisconsin gained just 183 total yards and converted 11 first downs, going 2-of-11 on third downs. The Badgers also turned the ball over twice, including a pick-six which was returned by Michigan’s Lavert Hill. Shea Patterson wasn’t anything special as a passer, but he did have one of the weekend’s biggest highlights to set up Michigan’s first score. And where he struggled through the air, Michigan’s run game more than made up for it by racking up 320 yards and three scores. It was a huge show of force by Jim Harbaugh’s team, which is now in great shape to challenge Ohio State for the B1G title later this year.